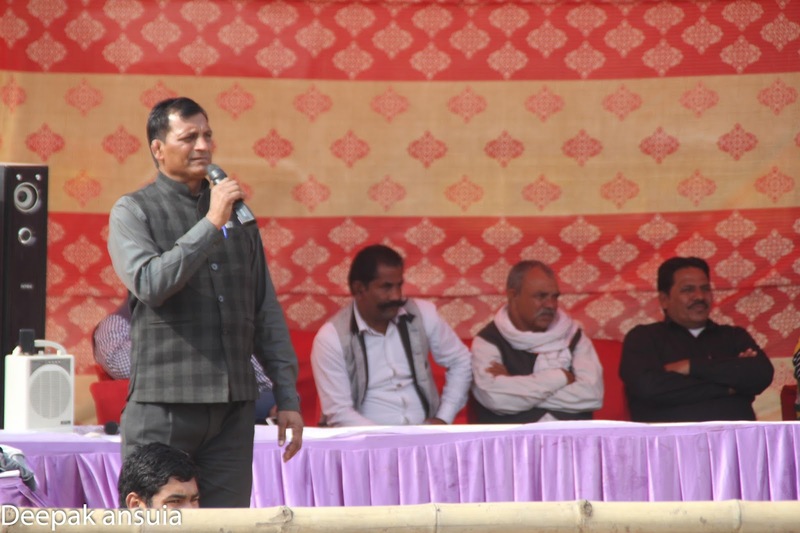 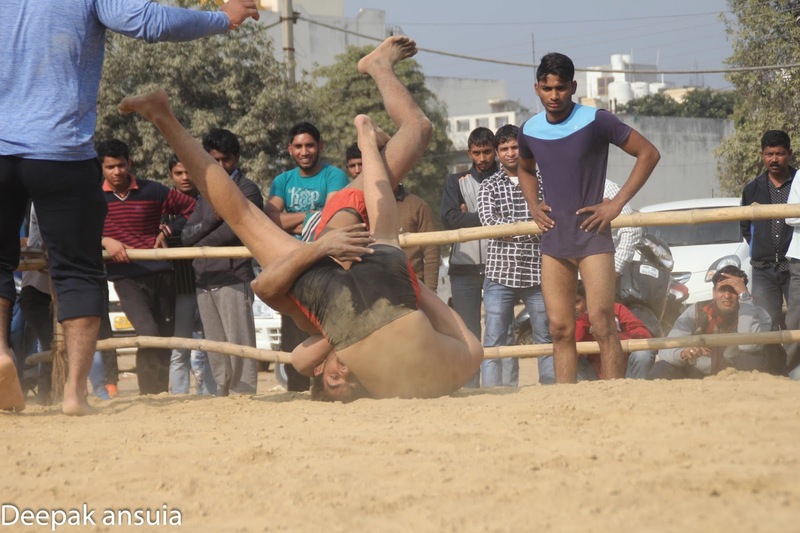 आजादी का परवाना , नेताजी सुभाष चंद्र बोस ! शहीदों की मजारों पर लगेंगे हर बरस मेले ! वतन पे मरने वालों का यहीं बाकीं निशान होगा !! 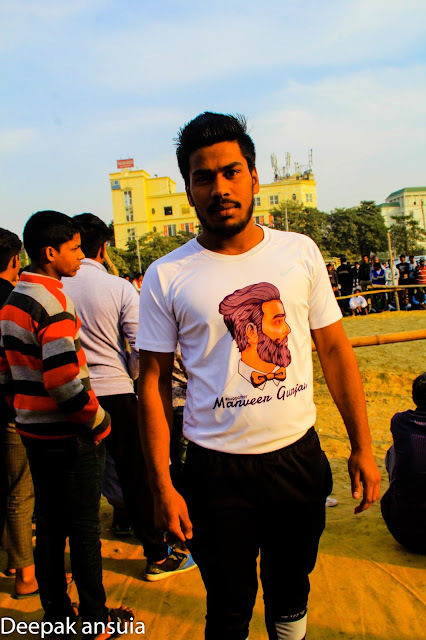 Today is 23rd January, the birthday of the great son of India, Netaji Subhash Chandra Bose, who helped start the revolution to set India free from British rule. 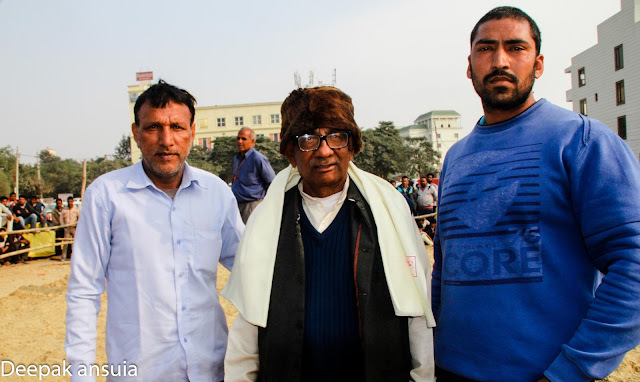 During WWII, he raised an army of captured Indian soldiers fighting for British and named it “Azad Hind Fauj”. 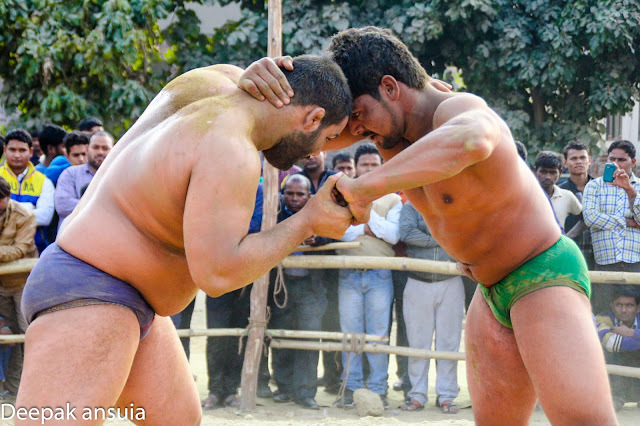 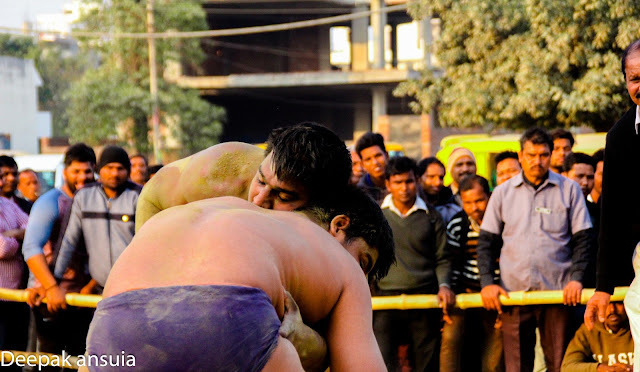 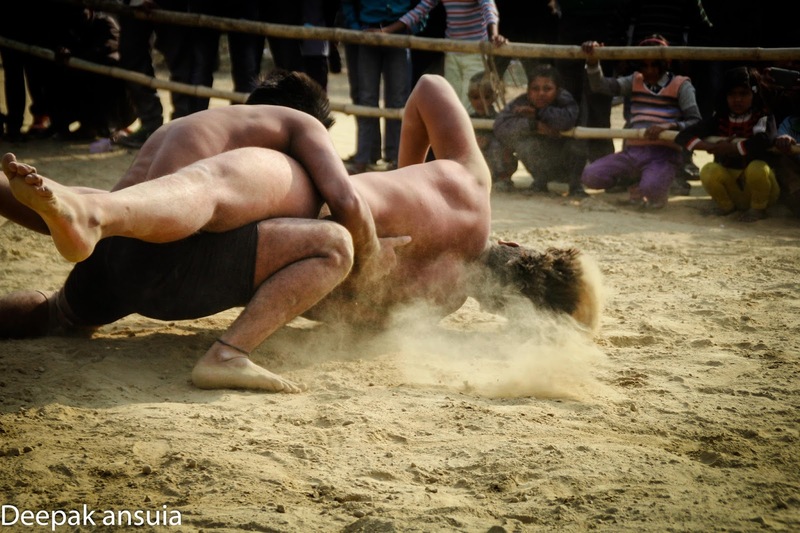 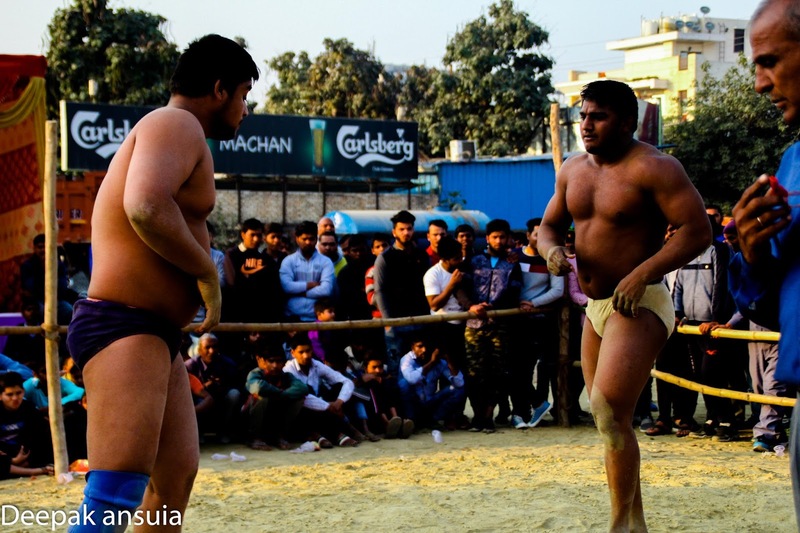 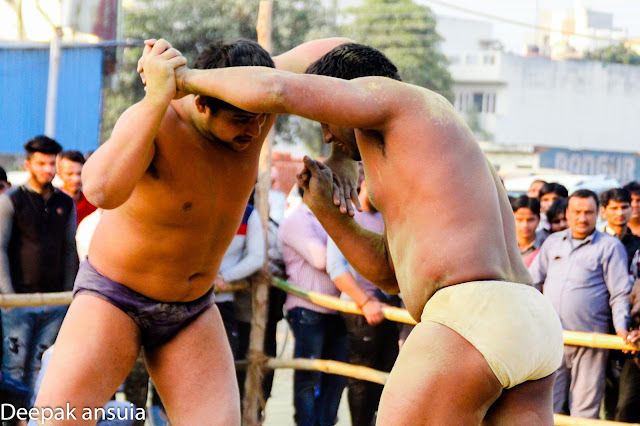 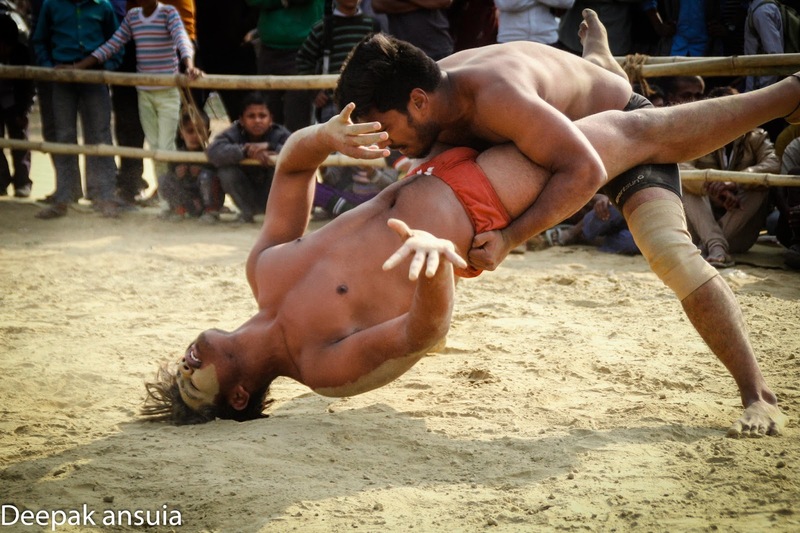 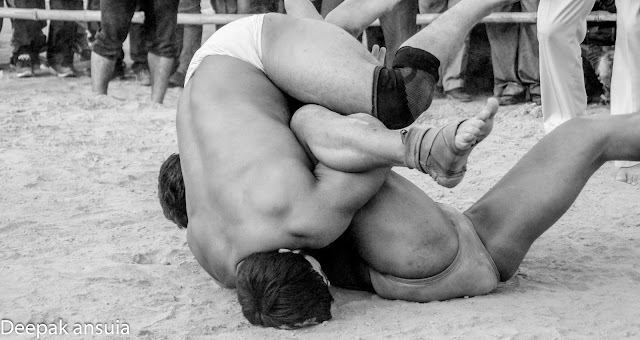 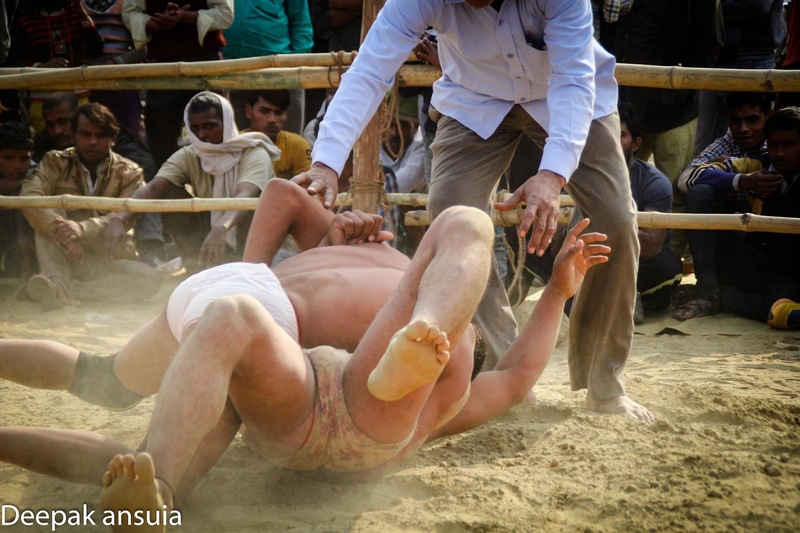 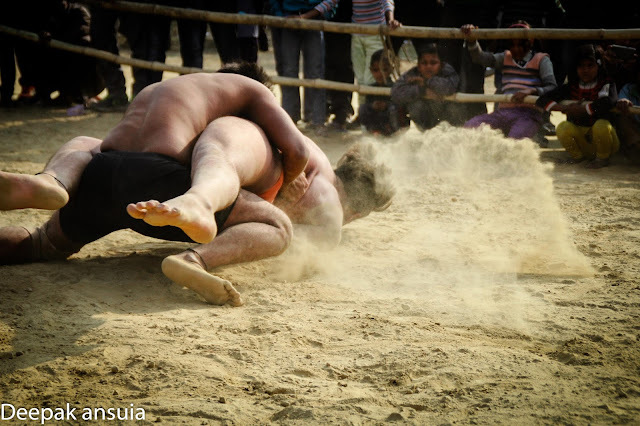 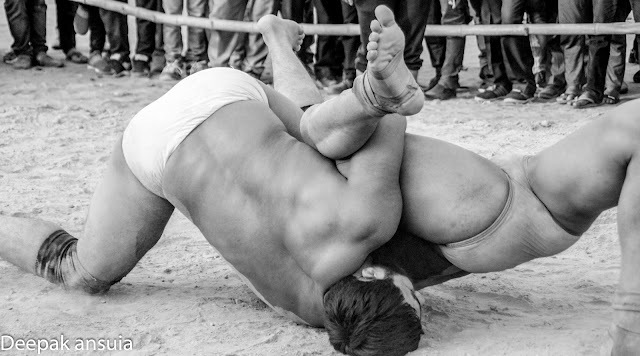 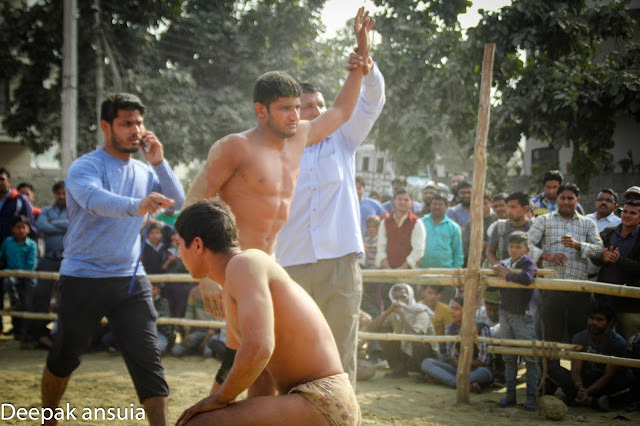 Today there is a festival in village Nathupur to mark the day of his birth, featuring a dangal, which draws wrestlers from far away. 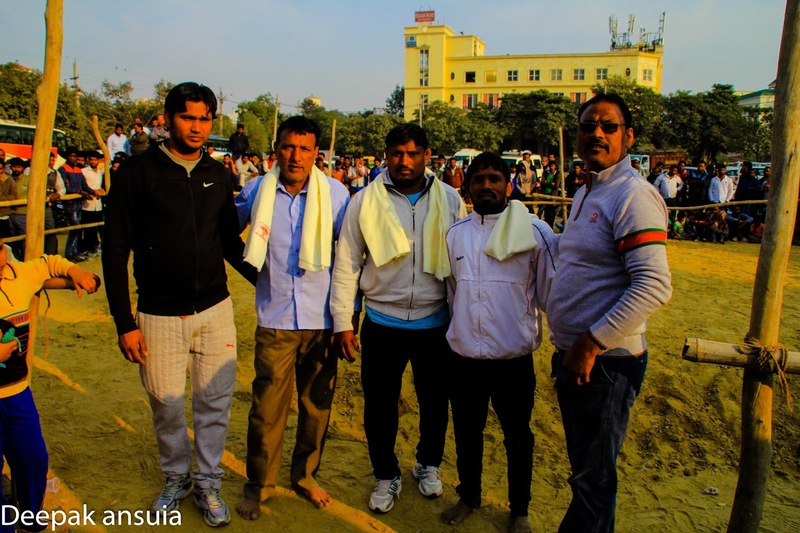 Goru, Joni, Kalu, Renupal, Devender, Bedu and other members of the committee organized the competition. The announcer, Guru Harpal, tells the gathering about the contributions of Neta Ji Subhash Chandra Bose in our struggle for freedom. 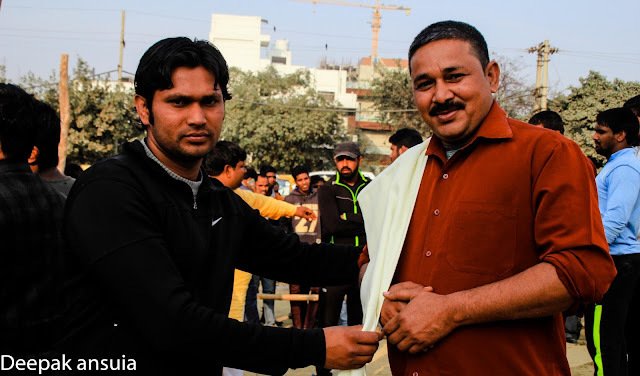 Senior coach Jaibhagwaan Manish acts as referee. 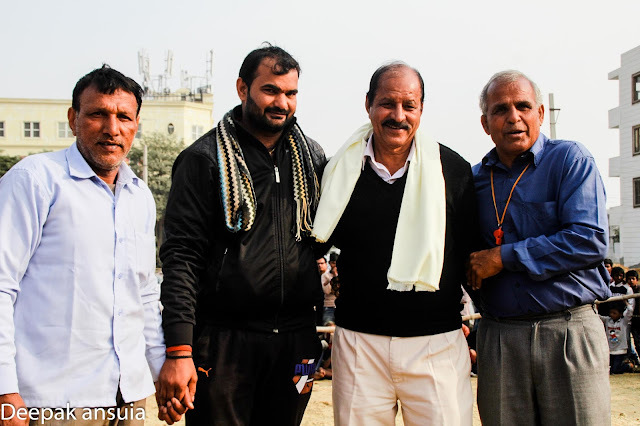 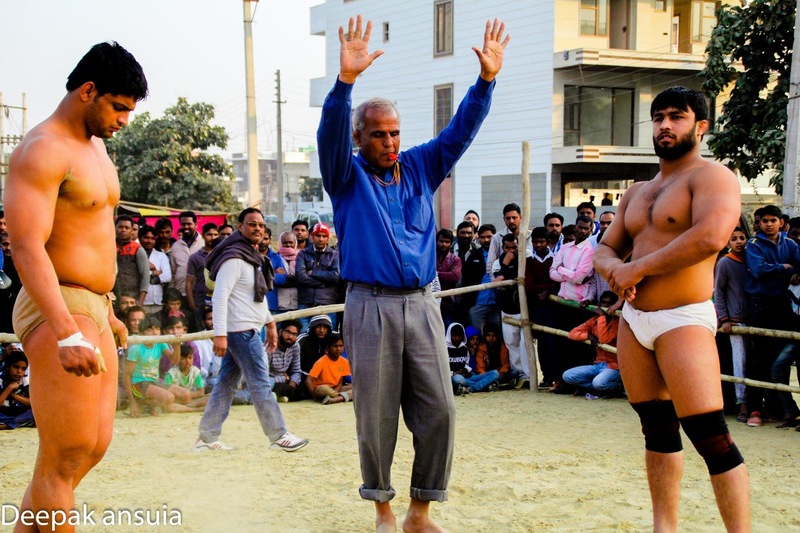 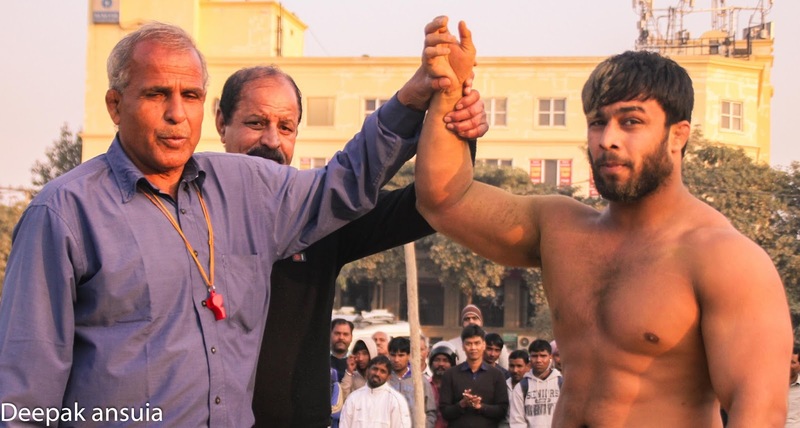 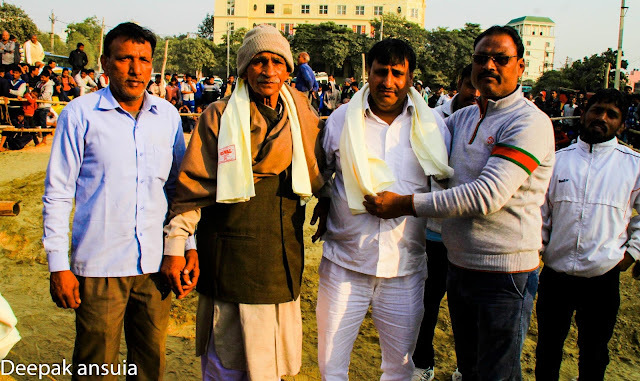 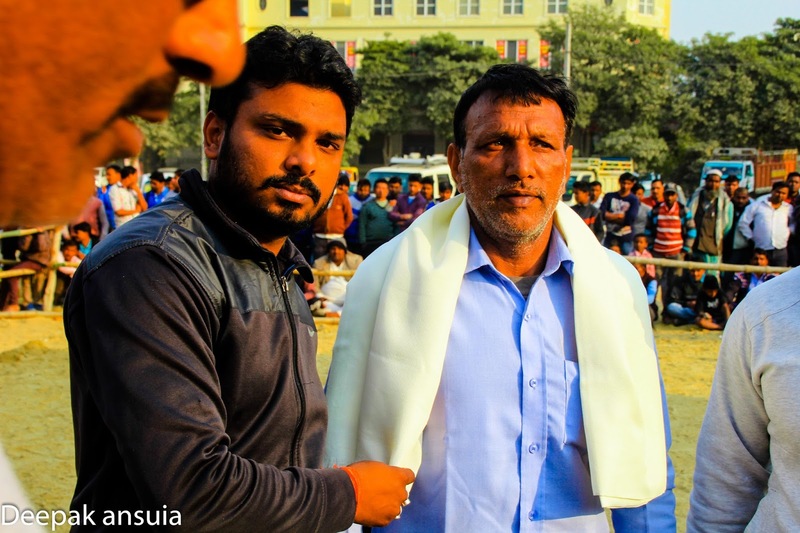 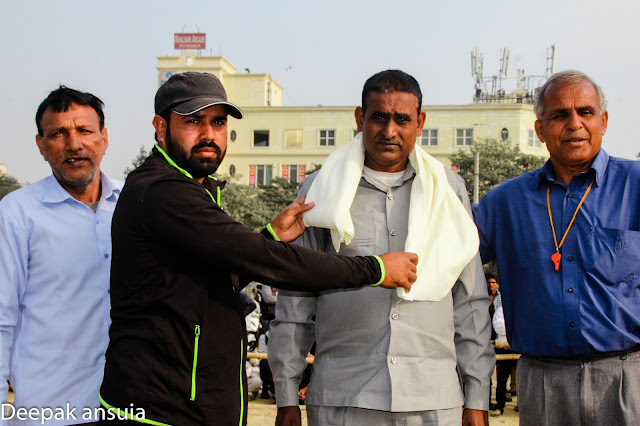 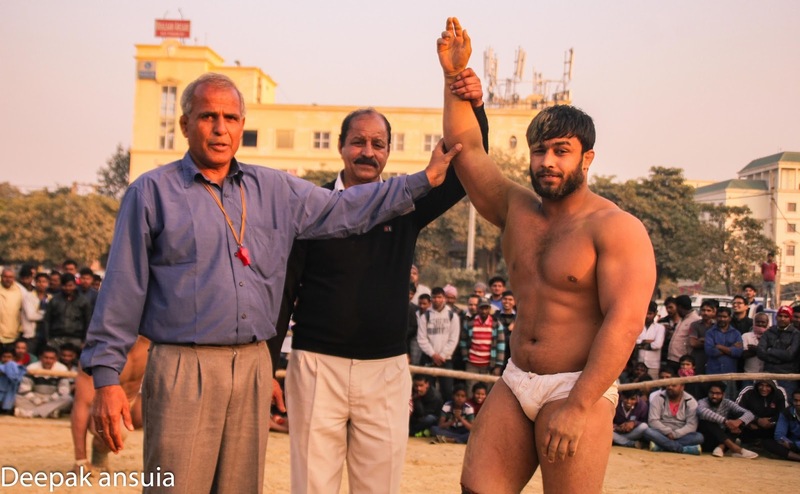 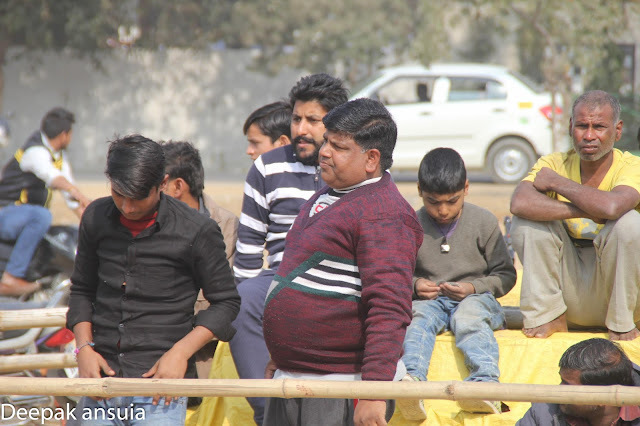 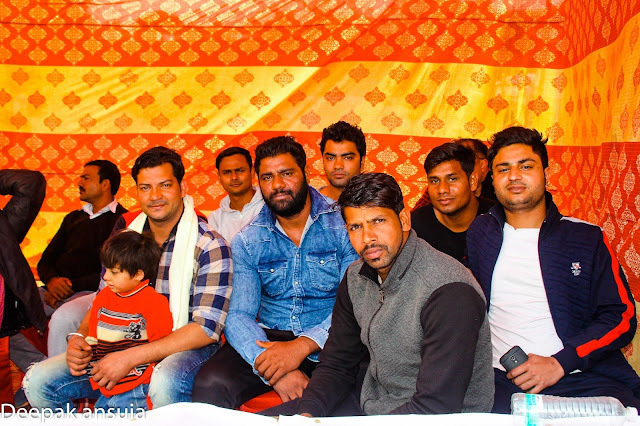 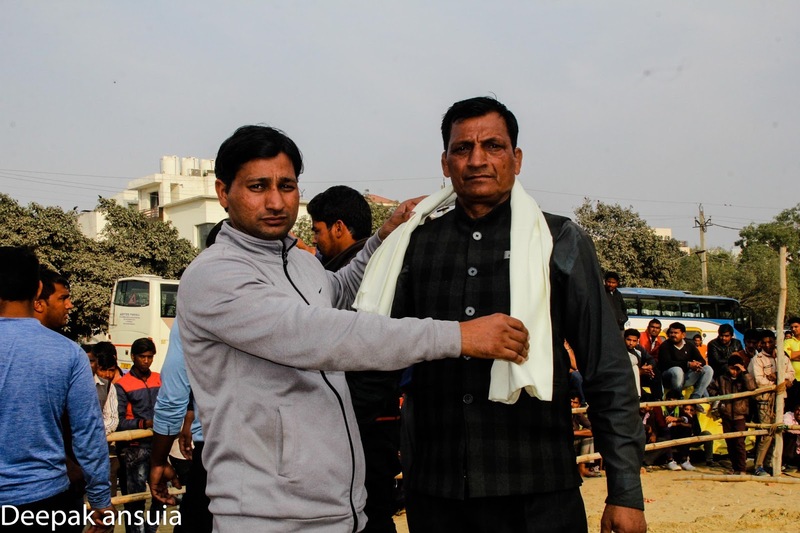 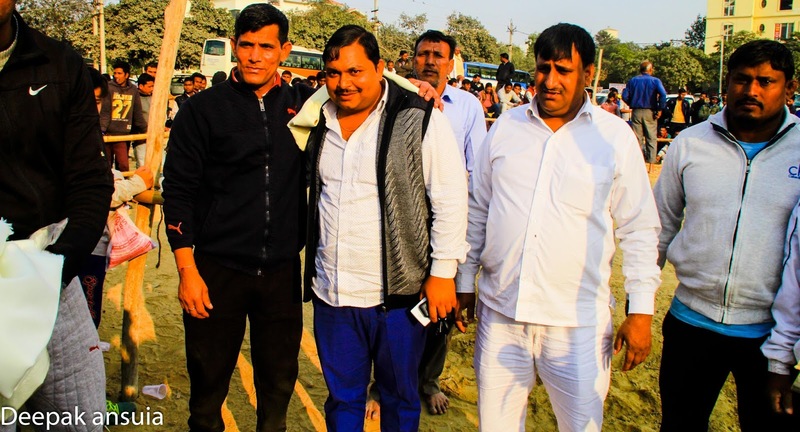 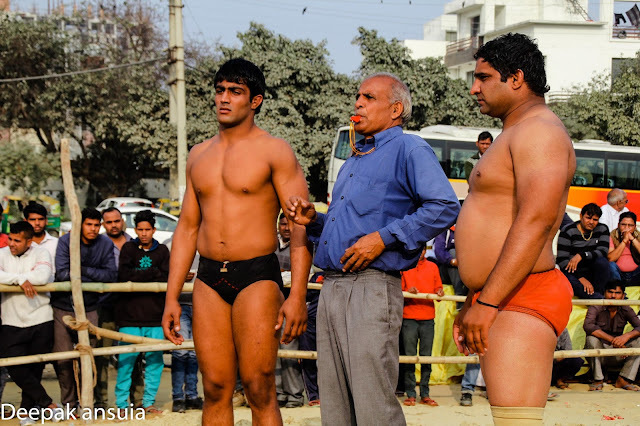 Rajinder Pahalwan, son of legendary wrestler Late Guru Shyamlal pairs wrestlers and prepares them for the bouts. 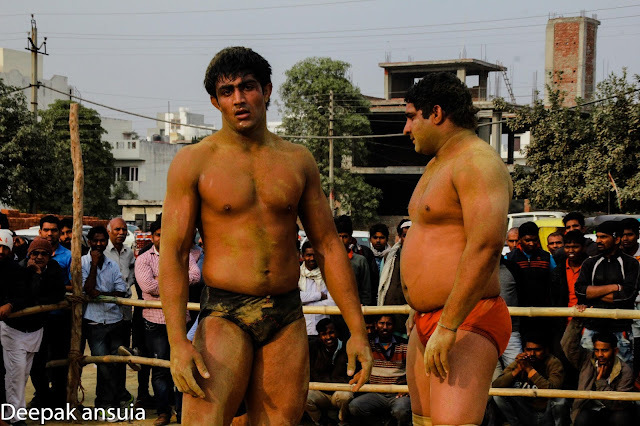 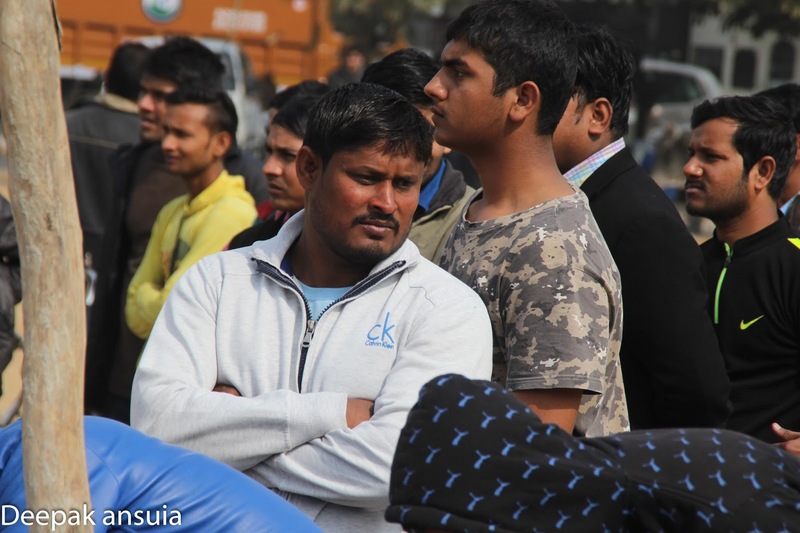 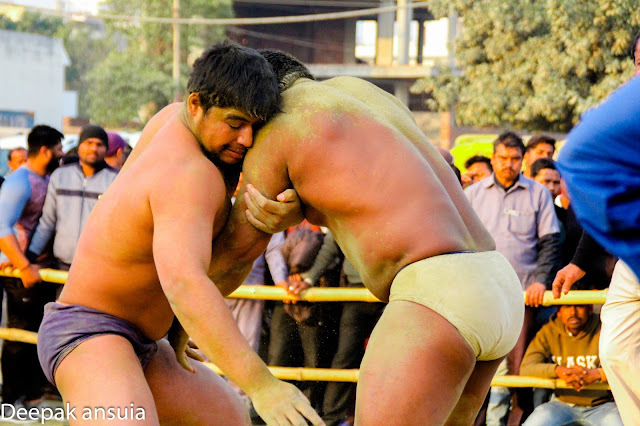 Jeetu is a star wrestler of the town. 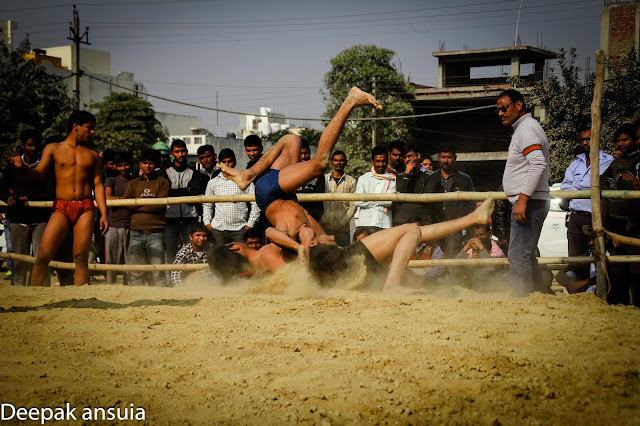 Today he took on a wrestler from Mandothi. 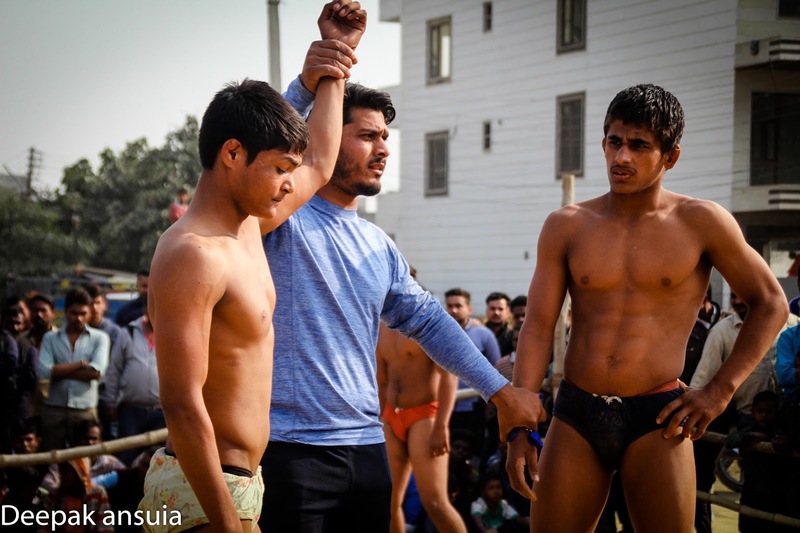 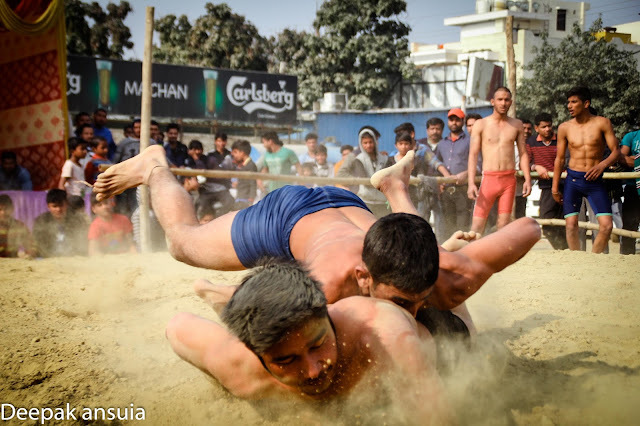 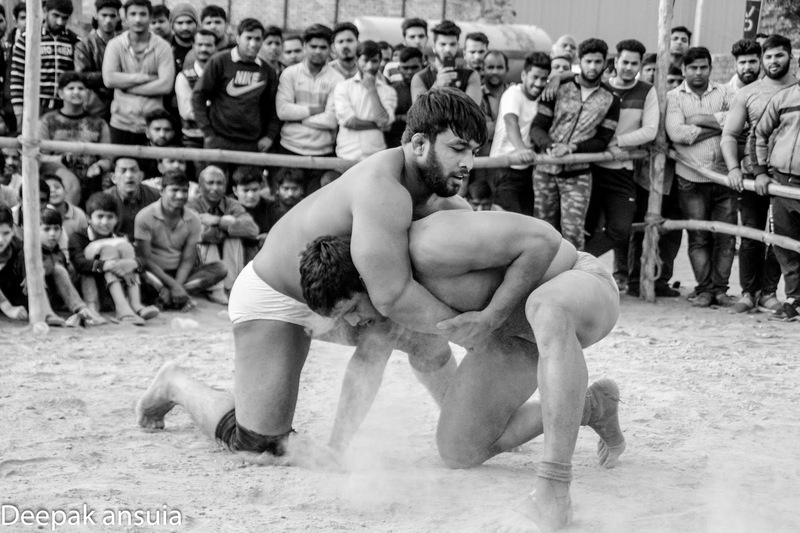 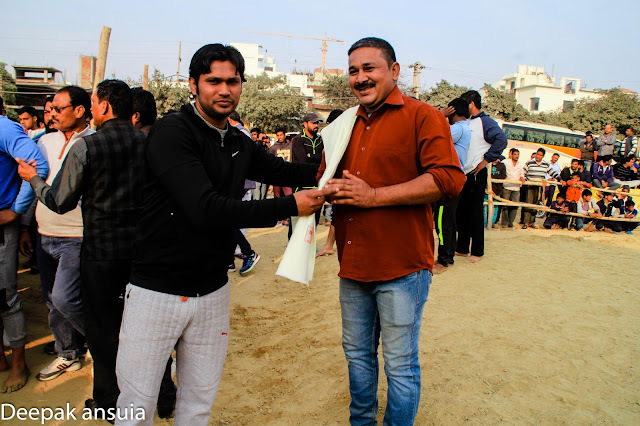 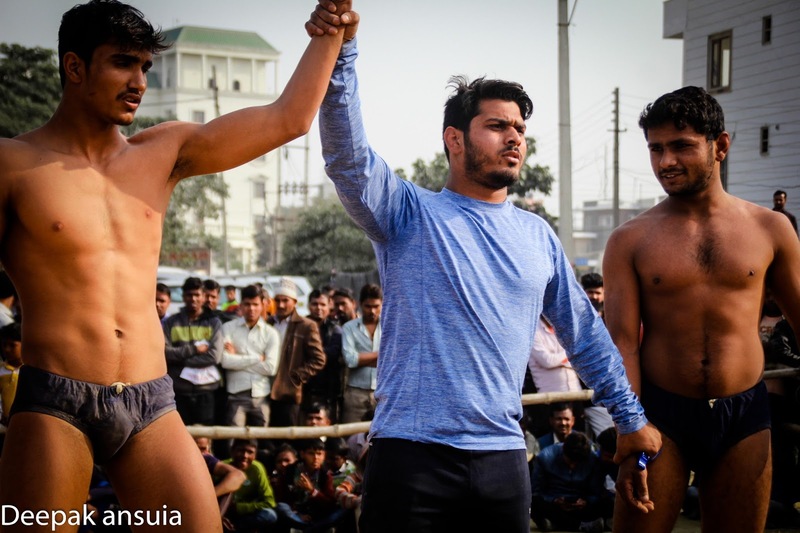 His opponent was formidable, but Jeetu is a master of the art of wrestling and pinned the Mandothi wrestler with ease, proving once again that he is one of the best wrestlers in the region. 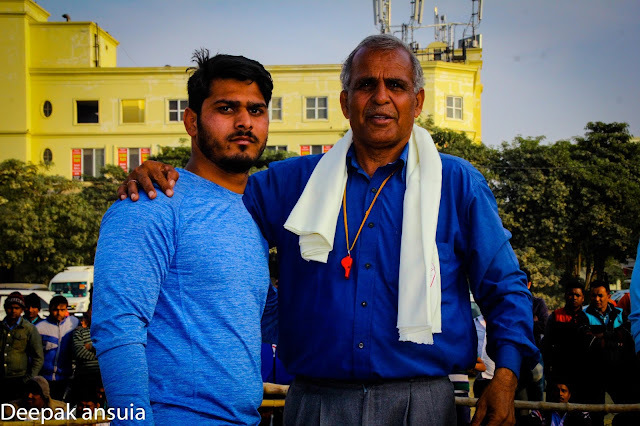 Gyaninder pahlwan is from Guru Hanuman Akhada. 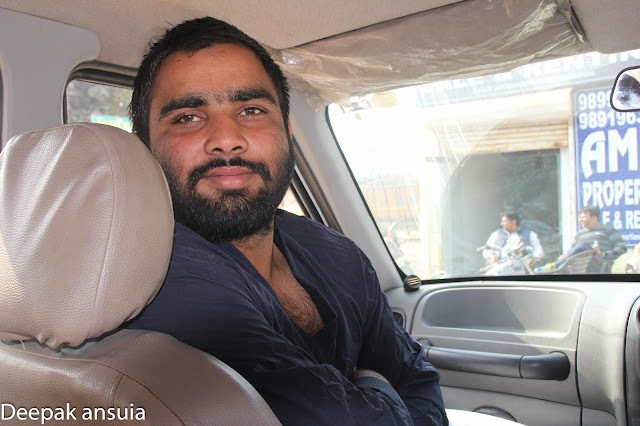 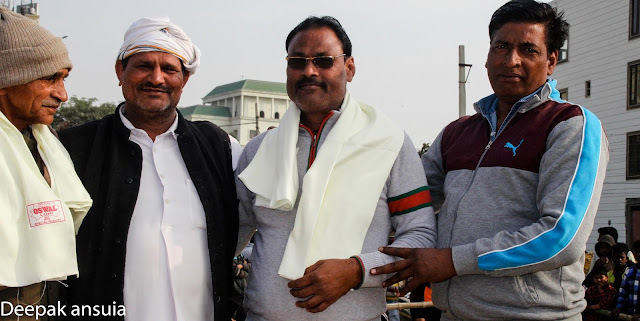 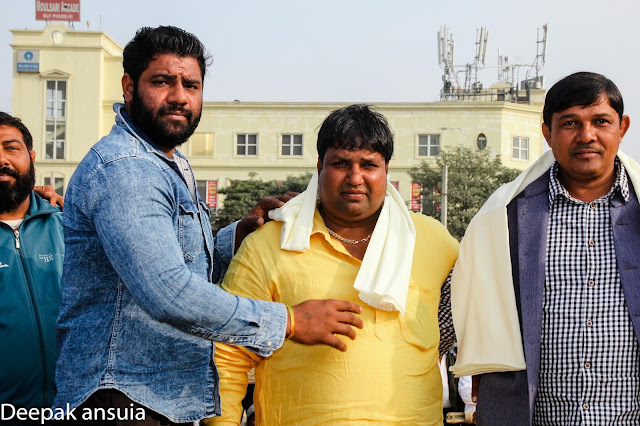 His father, Nain Singh also runs an akhada in Gadhi Mandu, Delhi. 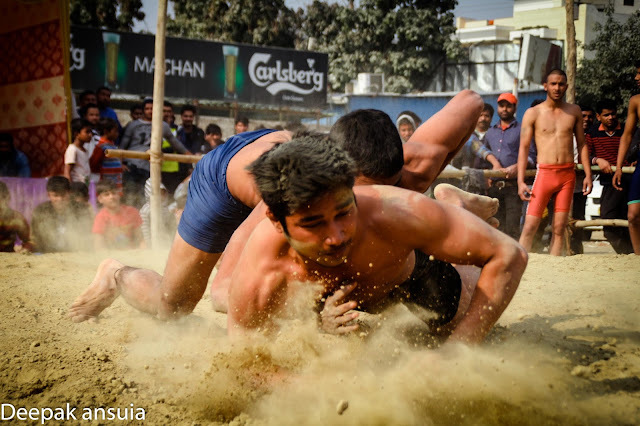 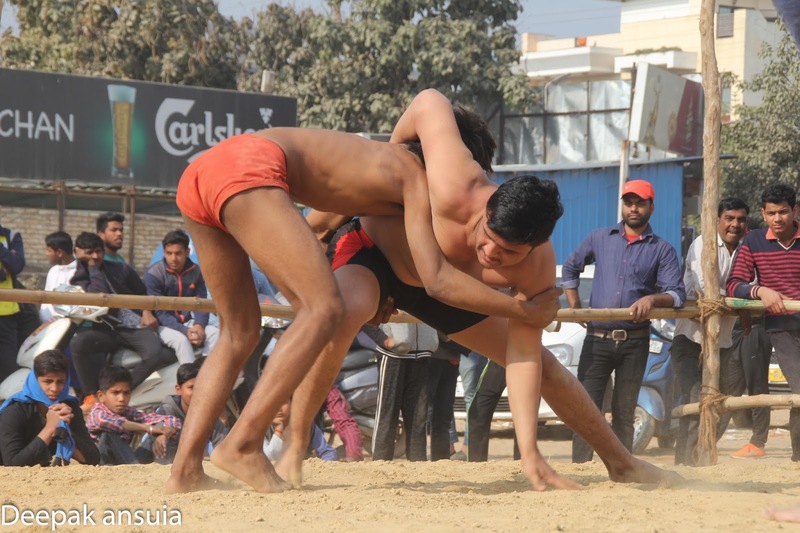 Gyaninder has guts and stamina and was on the offensive for most of the match, but Lakshman held him off and avoided being pinned and the match ended in a draw. Ravinder is a more experienced than Pawan. He dominated Pawan throughout the match but Pawan kept fighting and in the end, Ravinder couldn’t get the fall, so the match ended in a draw. 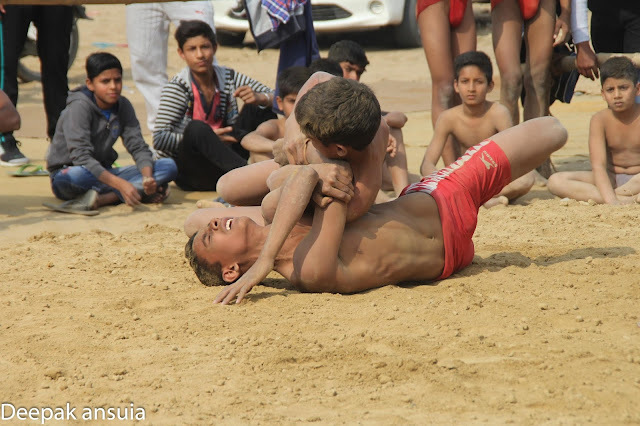 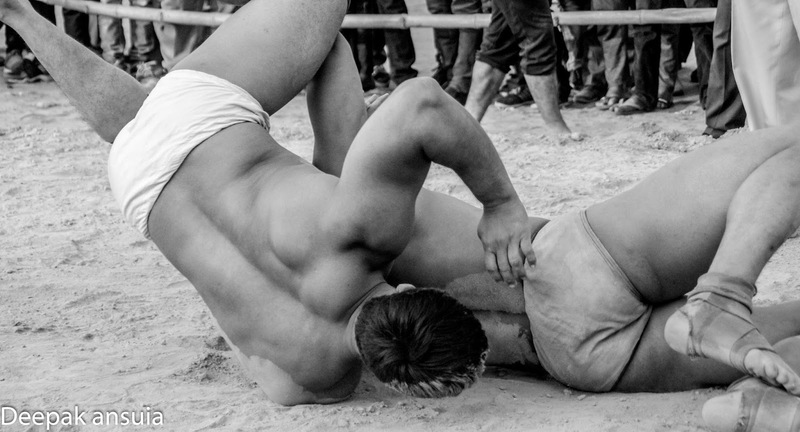 There were many more matches for younger wrestlers. 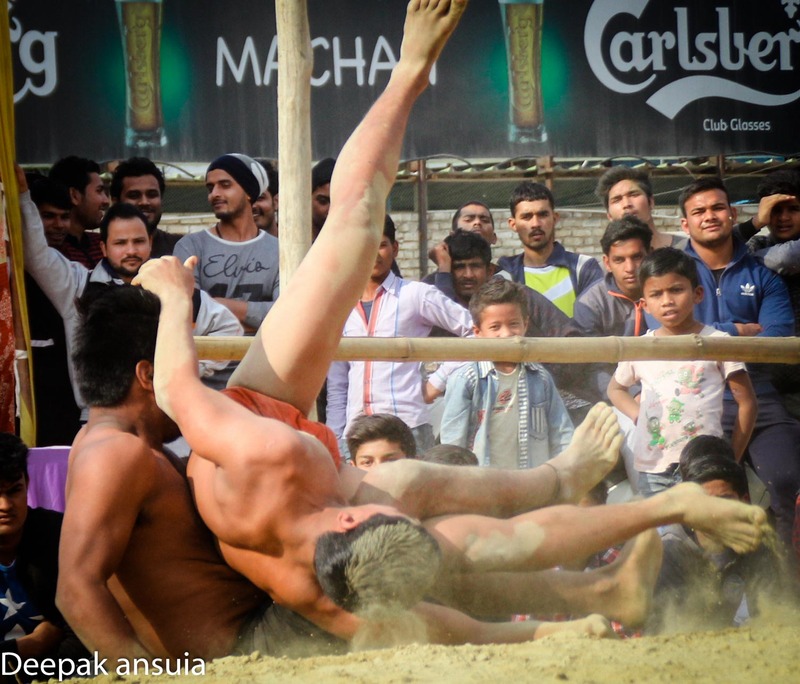 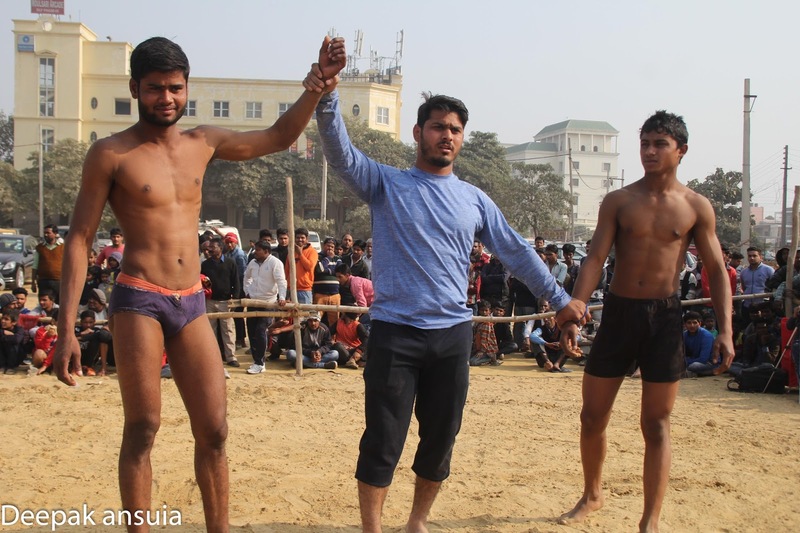 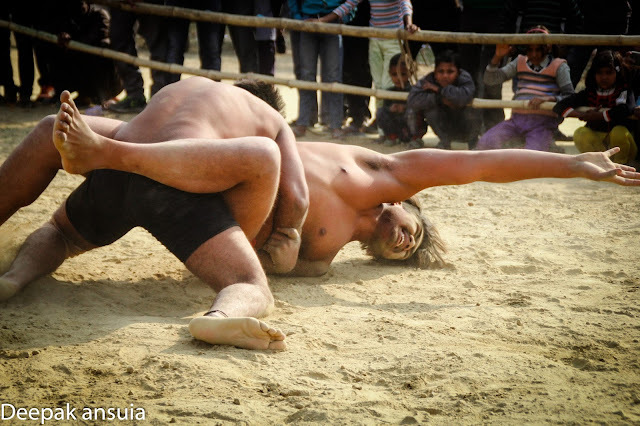 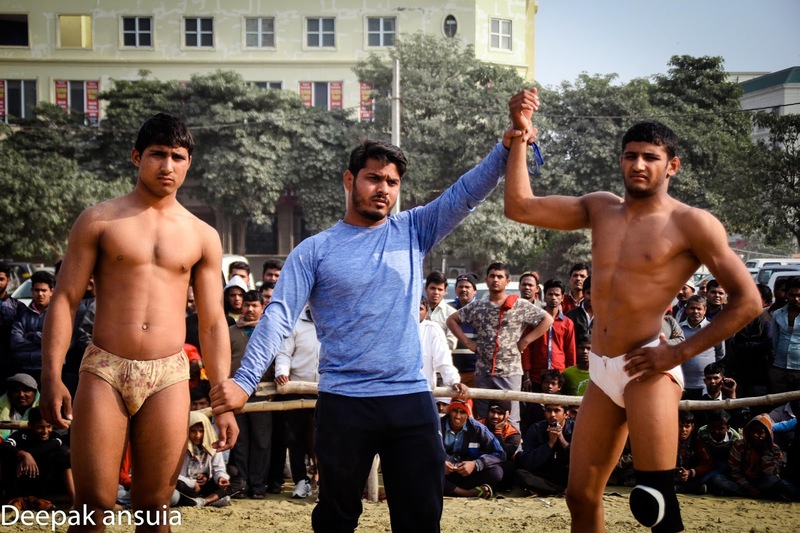 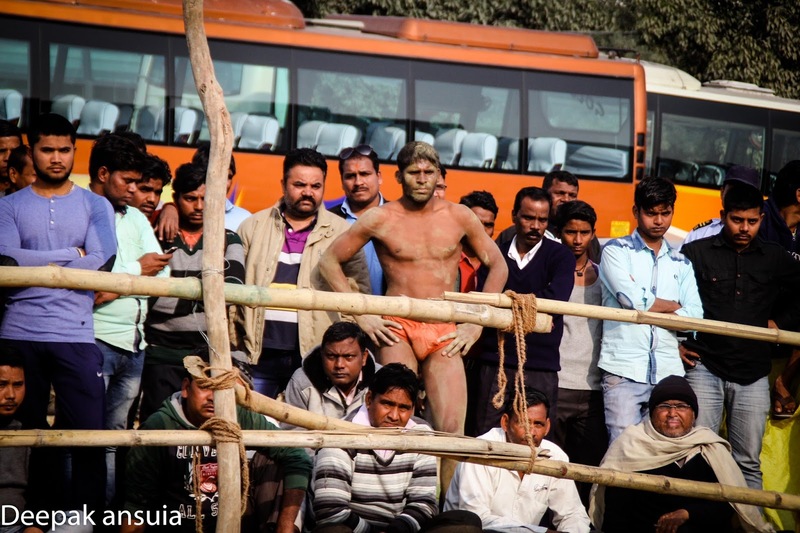 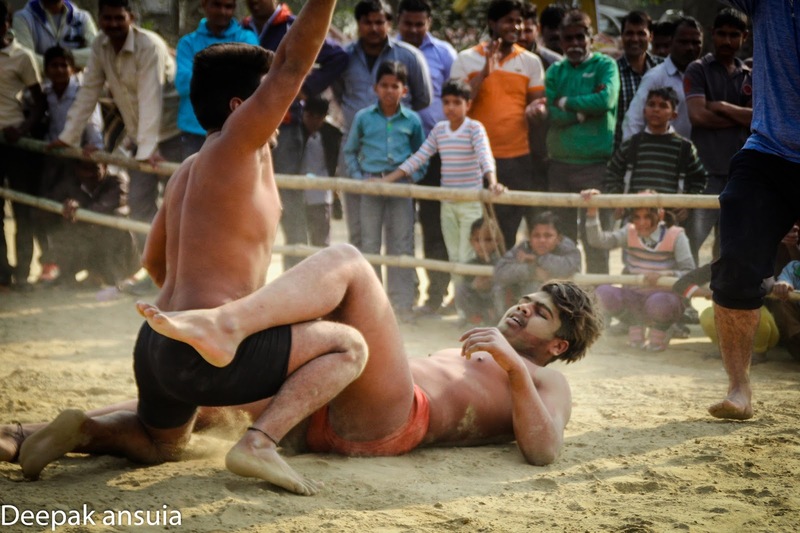 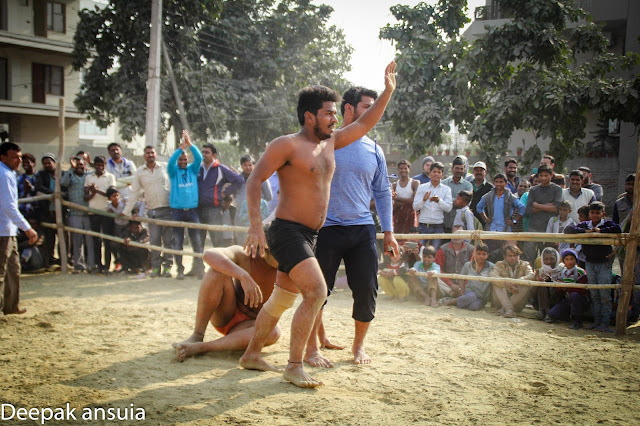 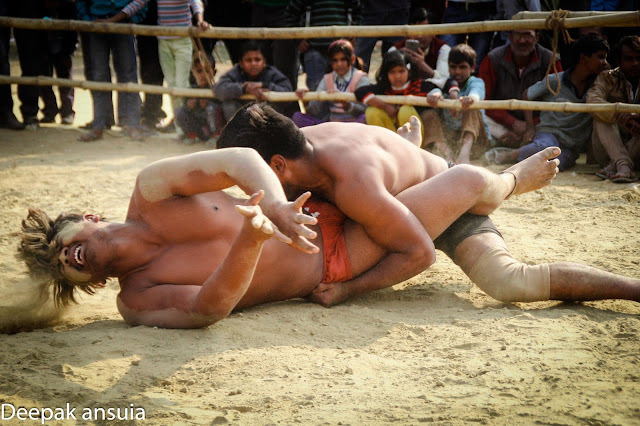 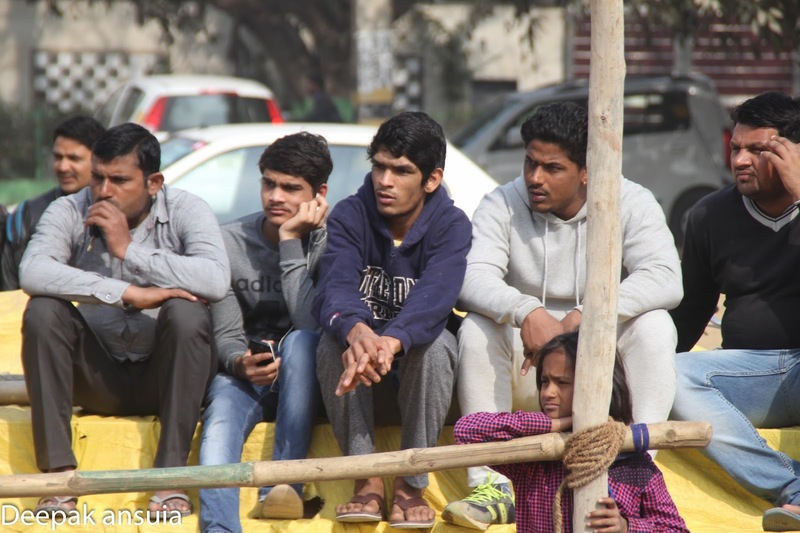 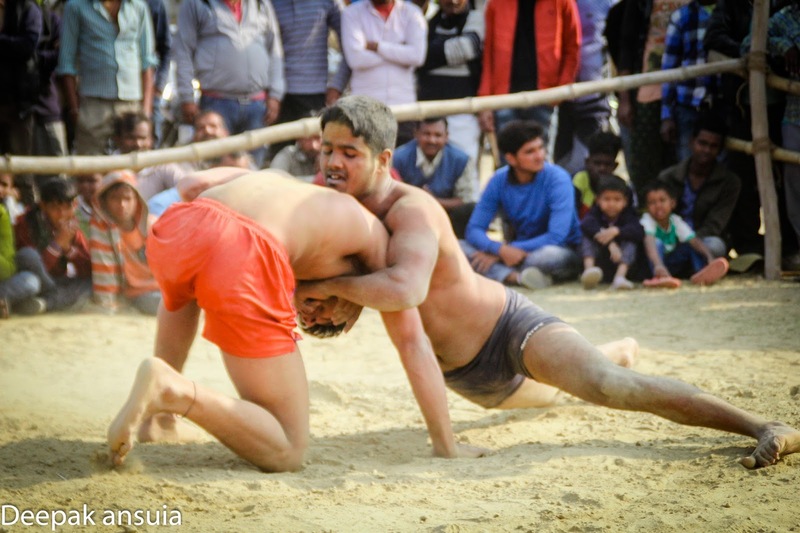 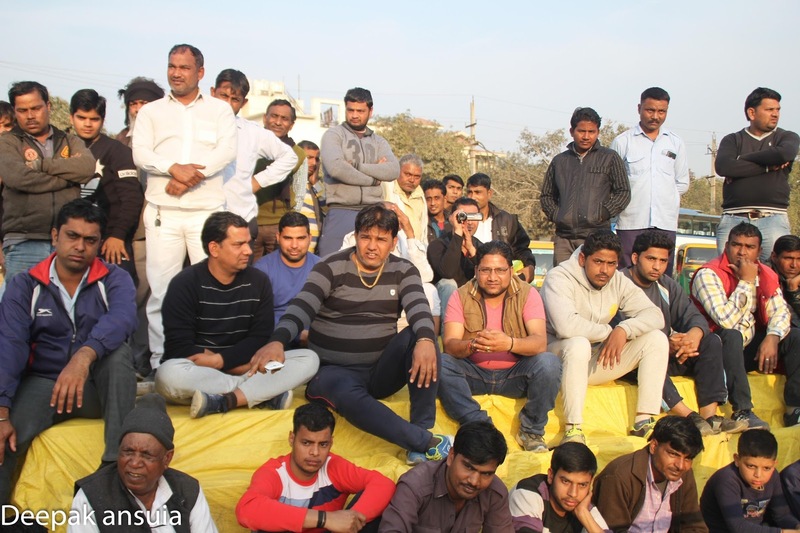 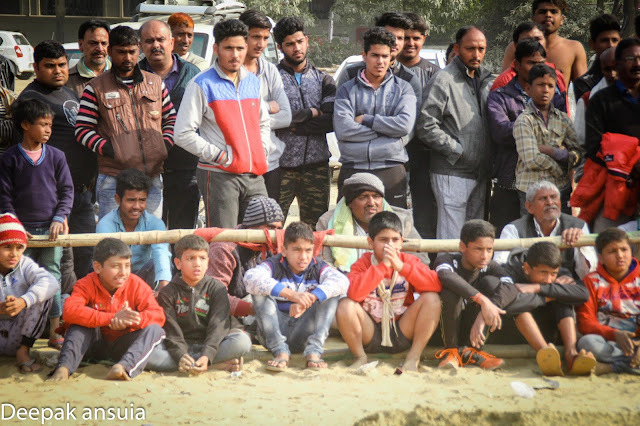 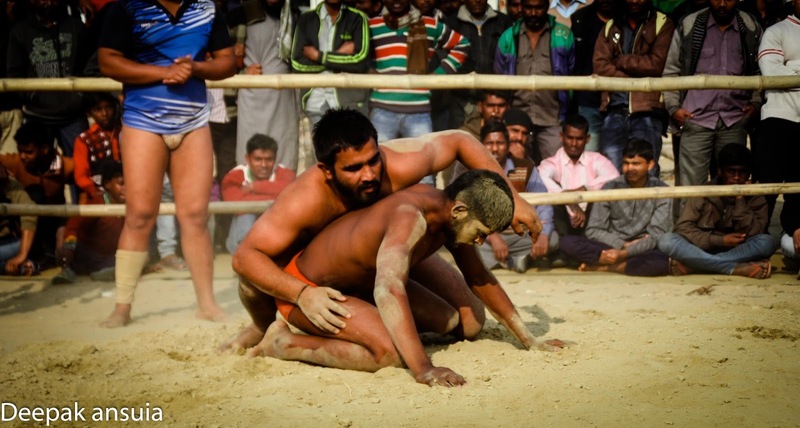 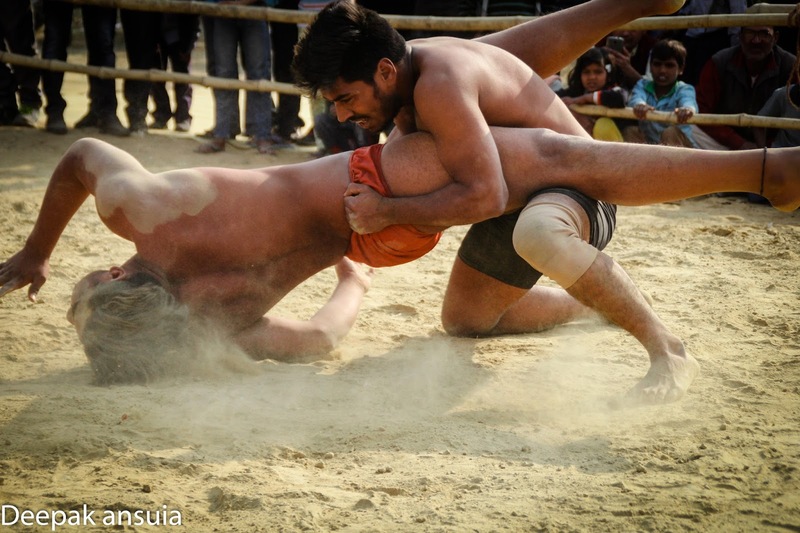 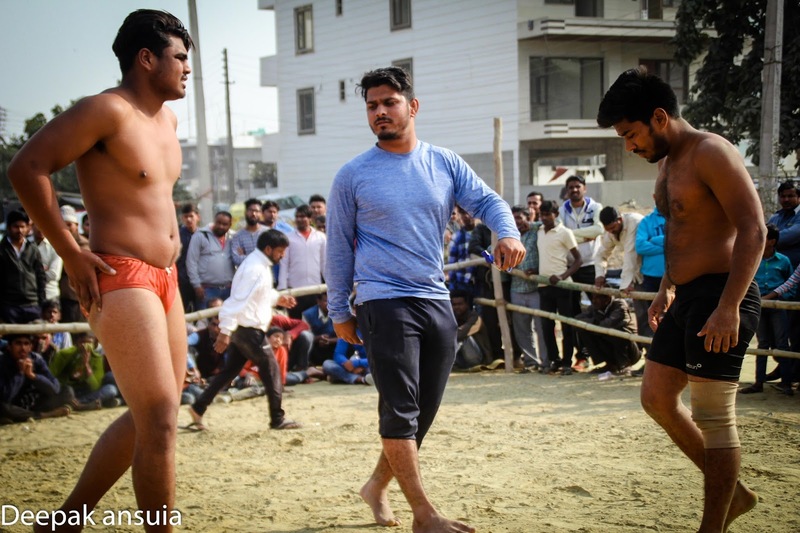 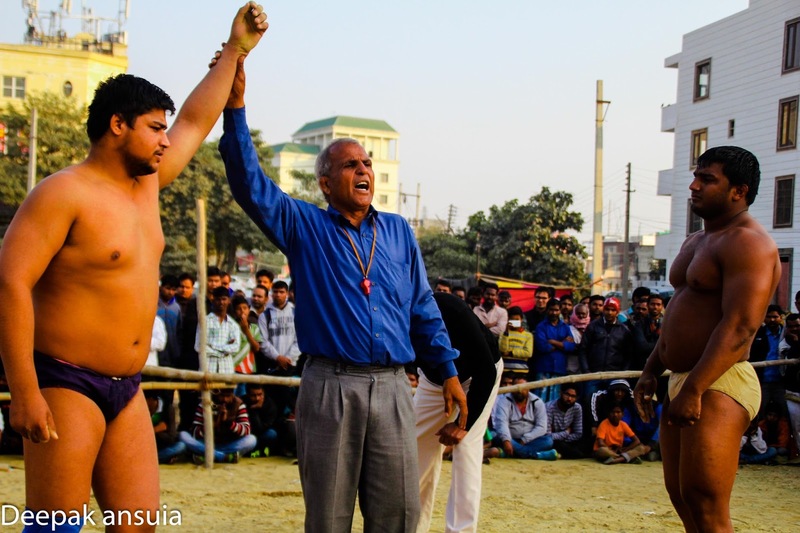 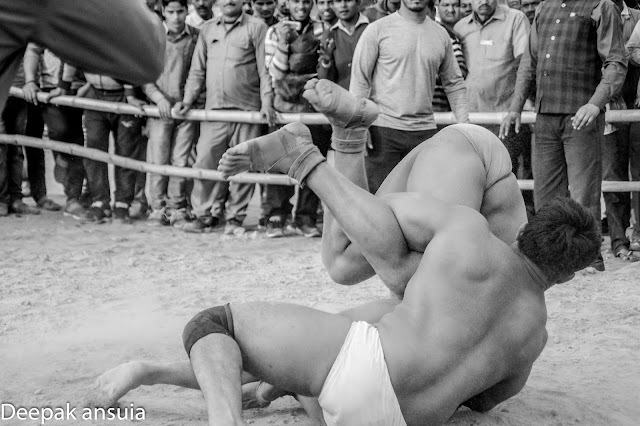 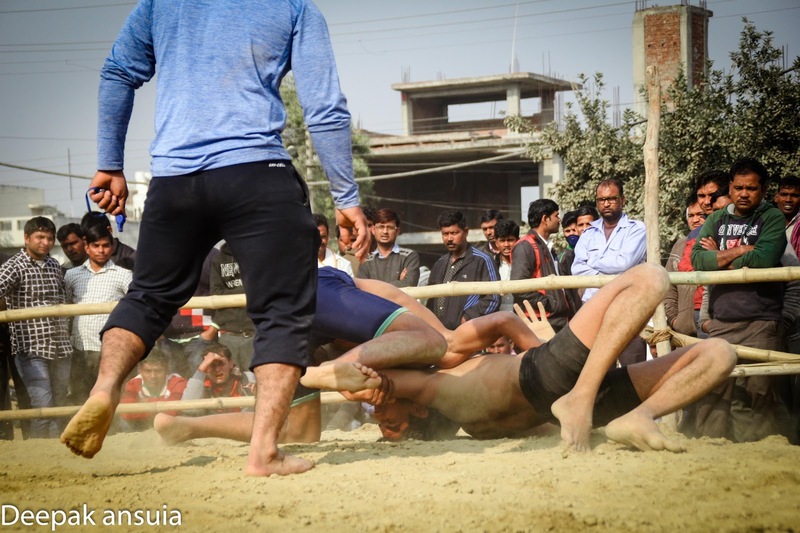 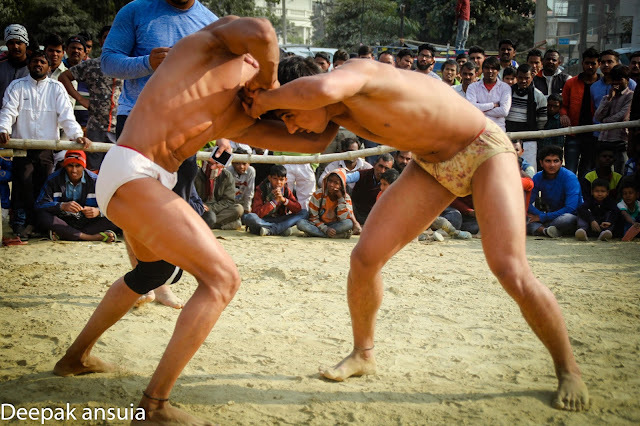 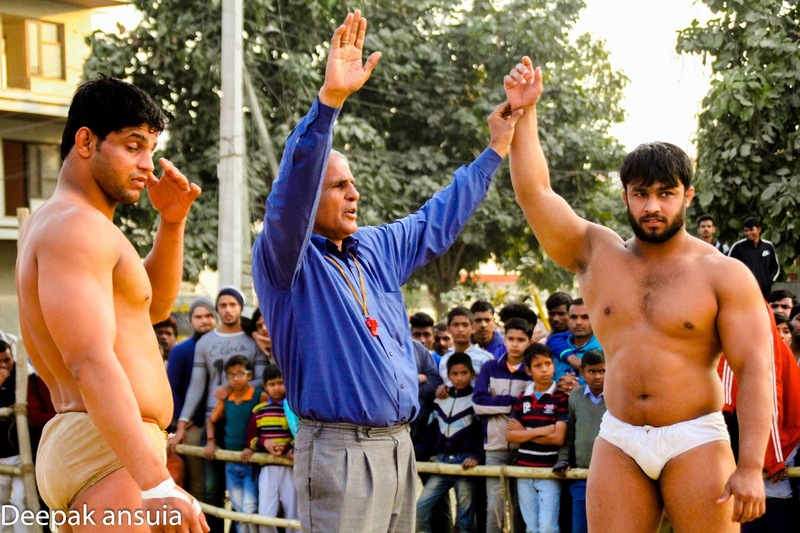 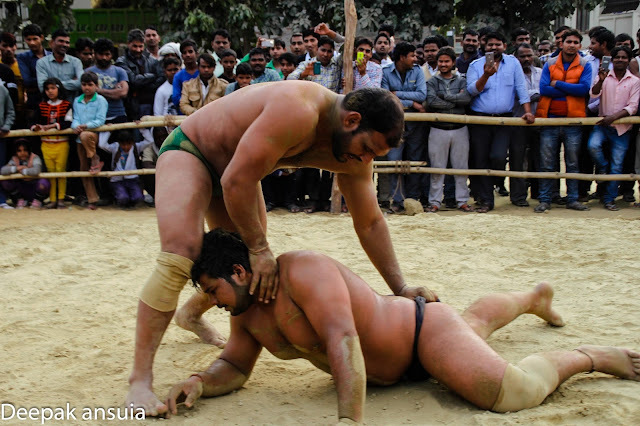 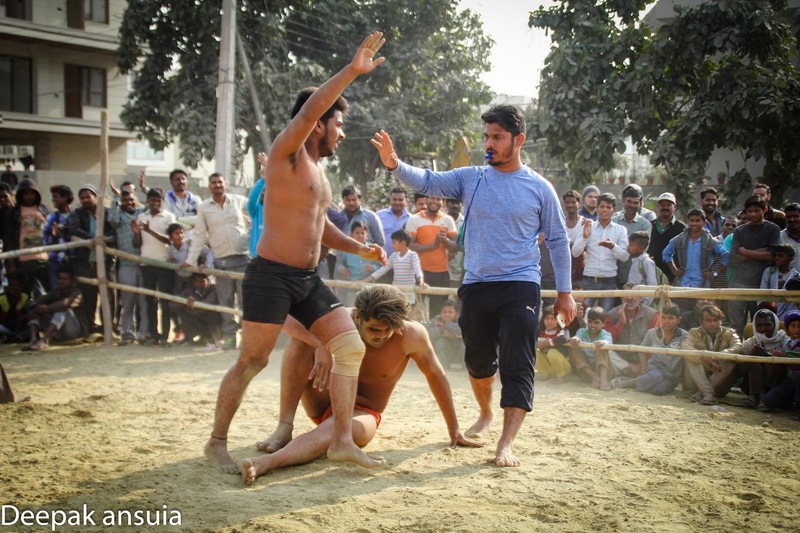 Wrestlers Happy, Gullu, Ramesh, Suresh of village nathupur fought well and won. 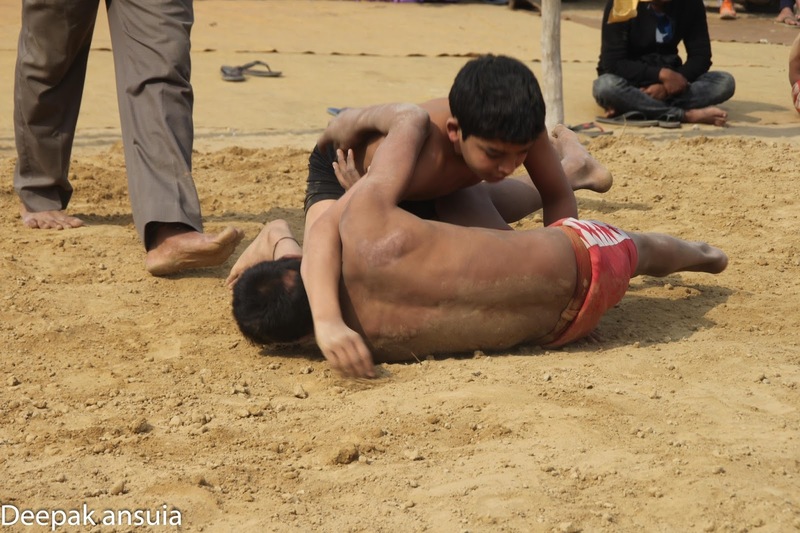 All the younger wrestlers were able to get several matches and got cash prizes each time they wrestled. 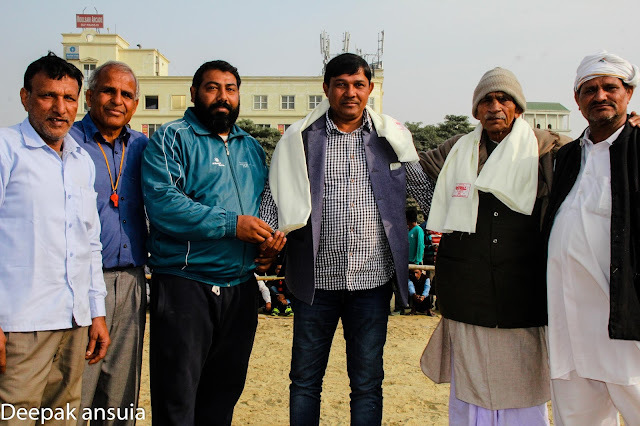 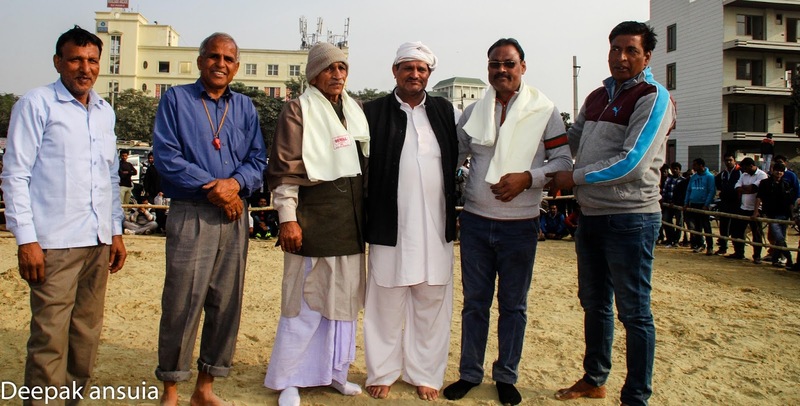 As the tradition goes, all the coaches, gurus, khalifa and other dignitaries were felicitated with headgear and some cash prize.